Through our advertising partners, Exterion Media, we are able to offer a selection of opportunities for advertising. You can advertise on the inside of almost all of our fleet, and the rear and side panels of most of our buses. Side panels are generally not available for advertising in East Sussex or Surrey. 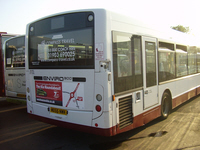 We can also offer more extensive on-bus advertising, right up to having the bus covered in an all-over advert! With Compass, you can advertise throughout Brighton, West and East Sussex. and on services 42 & 123 in Surrey. Our vehicles generally stay on the same services so that you can target your advertising. If you wish to advertise more extensively, then our partners CBS Outdoor can offer even more advertising opportunities!